Welcome to my insidious trap. We all know it’s never the best or the most important articles that get clicks. It’s always ‘THE ANSWER WILL SHOCK YOU’, celebrity gossip, and cute cats that hog all of that sweet sweet traffic. I usually cover ‘boring’ (yet incredibly important) regulation stuff, like EU’s highly contested Copyright Reform — which doesn’t get read a whole lot. But after seeing ‘Miley Cyrus wishes Liam Hemsworth a happy birthday all over social media and it’s the sweetest‘ I decided that two can play that game. What Mashable missed in its in-depth coverage was that the overly sappy Instagram post full of love and whatnot wasn’t the real story — the real story lay in Miley’s birthday wishes on Twitter. Aww, look at them, such a happy couple! And what a beautiful heartfelt message: HBD. But what’s that playing in the background? Well, it’s of course the incredible ‘One Way Ticket’ by The Darkness… which is copyrighted material. Now we’re finally getting to the juicy regulation stuff: the song, the platform, and Miley’s celebrity status all matter when it comes to EU’s proposed Copyright Reform, which is scheduled for a final vote in March 2019. One of the biggest controversies of the new EU legislation is ‘Article 13’ — which opponents have dubbed ‘censorship machines’. Article 13 will make platforms responsible for monitoring user behavior to stop copyright infringements, which basically means only huge platforms will have the resources to let users comment or share content. There’s a worry that this could lead to broader censorship, with free speech vehicles — like parody, satire, or even protest videos — potentially untenable under this system. 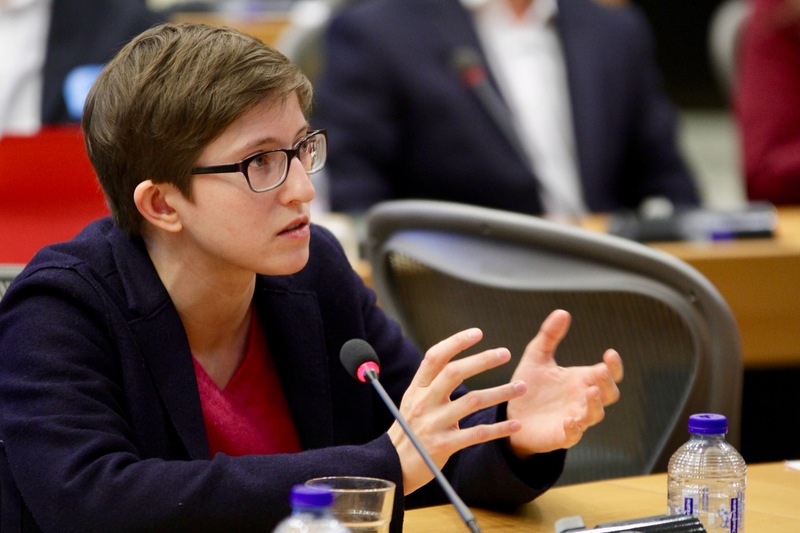 To shed a light on how Miley Cyrus’ tweet would fare under the EU‘s upcoming Copyright Reform, TNW reached out to Julia Reda (Pirate Party, Greens-EFA), member of EU Parliament and one of the proposal’s staunchest opponents. It’s clear that under US law, Miley’s tweet (yes, we’re on a first name basis) would’ve been fine because the inclusion of a few seconds of The Darkness’ song, causing the band no financial damage, would fall under fair use — but Reda says that wouldn’t be the case in the EU if the legislation will be passed. “EU copyright law, however, does not know fair use, it only has specific, optional exceptions for parodies, quotations, educational etc., none of which would clearly allow this kind of use of a piece of music,” Reda wrote TNW. There’s a possibility that the tweet would be covered by one of the copyright exceptions, such as ‘incidental inclusion’ — but Reda points out that it’s not mandatory for all member states and it might not even be implemented in the final version. How will platforms stop Miley’s tweets of copyrighted material? Here’s the crux of the issue. If platforms are liable for all content shared by users — and have to make sure there aren’t any instances of copyright infringement — how can they prevent being exposed to lawsuits? Would companies like Twitter have to enable split-second filters that’d prevent any possibly infringing content, or would it be enough to remove the post after it had been flagged? During the Copyright Reform’s long and arduous process through EU Parliament, lovers and haters of the legislation argued over the exact ramifications of Article 13 and whether it would force companies to implement upload filters, de facto censorship machines, for user generated content — even though it’s technologically impossible. Reda and others said it would, while those in favor of the reform said ‘nope,’ and that the concerns were based on exaggeration of the legislation‘s text. The final wording of Article 13 is still being finalized, and we’ll likely see negotiations between EU Parliament and EU Council next week regarding the text. “One possible wording that is currently being discussed is that after a work’s copyright has been infringed on a platform once, the platform will have to ensure that the same work cannot be uploaded again, or face liability for copyright infringement,” Reda explains. 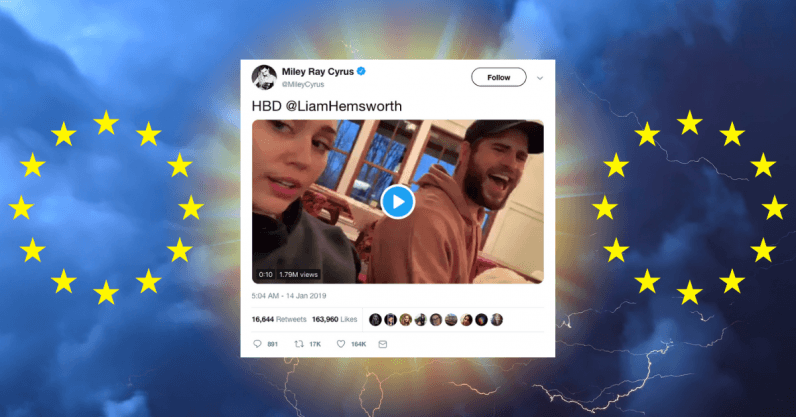 So let’s say The Darkness had sent a take down request to Twitter regarding ‘One Way Ticket.’ Twitter would have to prevent it from being uploaded again — which would include videos like Miley’s birthday wish to the dreamy Liam Hemsworth. “The proposal makes no difference between an upload of a full-length song in high quality and the use of just a few second in poor quality like in Miley’s video,” says Reda. It’d be relatively easy to prevent identical files to be uploaded (same size, hash, etc.) but the same work could be written down as a text, encoded in an image, or read out loud by a human in a video. Celebrities, YouTubers, and other content creators all leverage their social media presence to grow their brands and make money. Reda says the current text considers users that “generate significant revenues on online platforms” — like YouTubers and perhaps certain celebrities — are liable for the copyright infringements they might commit, even if the platform has bought a license from the original rightsholder. Reda adds that monetization and spread of your content will also be negatively affected by Article 13, because it follows the principle of “block first, ask questions later.” However, if legal content gets deleted by upload filters, users have the possibility to complain to the platform and have their content reinstated. “But if your trending video or Instagram posting is taken down just at the time when you are launching a new song or starting a new campaign, the damage is done and you will not be compensated for the platform’s error. Having your content reinstated a week later will be too little, too late,” Reda explains. So even though the premise of this article might’ve seemed a bit far-fetched, honing in on a random birthday wish between a celebrity couple, does Reda truly think posts like these would be affected by Article 13? What seems to truly trouble Reda, however, is the lack of visibility this issue might have in the general discourse — as well as the discrepancy in how users are affected by it. This seems bleak, but it’s still a possibility that the current version of the Copyright Reform will become law. “Thankfully, opposition to Article 13 in the European Parliament and among national governments in the EU is mounting and it is still possible to reject it in the final vote that is expected to take place in March,” says Reda. If you feel strongly about this issue and are a EU citizen, you can reach out to your MEP and voice your concern. In the mean time, send all the birthday wishes you can, Miley.